Twenty-three years ago, Rick Nation knew only that concrete was gray and it got hard. Today, he possesses a wealth of knowledge about mobile concrete production, rapid setting concrete and volumetric proportioning equipment. It all started when Rick gave up a 10-year career as a Snap-on Tool dealer to see what the future would hold in the concrete business. As Rick explains in this interview, through continued innovation and a commitment to exceptional customer service, that future is bright for the three companies his family operates near Eugene, Oregon. What attracted you to the concrete delivery business? in 1994 I quit my job and purchased a Cemen Tech MCD8-100, set up a yard and erected a silo. Here I am 23 years later with eight big, shiny red portable mixing trucks delivering concrete throughout the Eugene area, a concrete finishing operation and a Cemen Tech dealership. 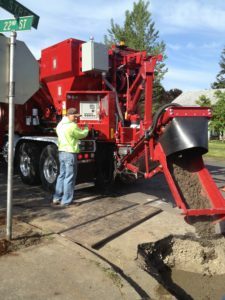 When I started, I found myself having to educate contractors about the difference between mobile concrete production and ready-mix delivery. Sometimes I poured a free yard of concrete just to get them comfortable with the process. After a while, contractors realized that with the right equipment, we were able to consistently deliver the correct mix design and the right additives for a quality, homogeneous mix. Best of all, because we hauled all the components of concrete on our trucks and mixed on site, contractors could get the exact quantity for their jobs without any waste, and they got it when and where they needed it. What’s a typical pour for Nation’s Mini-Mix? our customers complete a wide variety of projects from something as basic as fill for fence posts and patios to larger projects such as foundations and shop floors. Although we will continue to meet the needs of these contractors, we are aggressively growing our rapid setting concrete business. Tell us more about your experience with rapid setting concrete? Because Cemen Tech equipment is ideally suited for rapid setting concrete, it seemed like a natural direction in which the company could move, and it was! Last year we completed a two-month rapid setting project involving 2,000 yards of concrete on Interstate 5 in Seattle. Like our early days with mobile concrete production, we had to prove the value of our product, thistime to DOTs and their contractors. Highway projects such as these specify a limited window of opportunity to complete the pour and open the road for traffic. Not meeting the deadlines imposed by DOTs results in hefty penalties. It’s a high-risk/high-reward type of work that can be accomplished only with mobile concrete production. We’ll prove that in this year on a proposed project that involves 3,000 yards of rapid setting concrete on northbound Interstate 5! 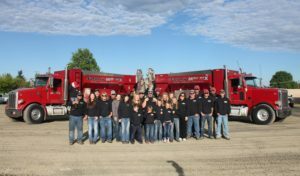 Did being a Cemen Tech customer influence your decision to become a dealer? Definitely. Cemen Tech is an integral part of our success. Our delivery and rapid setting concrete business would not be where it is today without having access to the highest quality volumetric proportioning equipment supported by the most responsive customer service team. I became a Cemen Tech dealer in the early 2000s to help other business owners control their future with Cemen Tech. 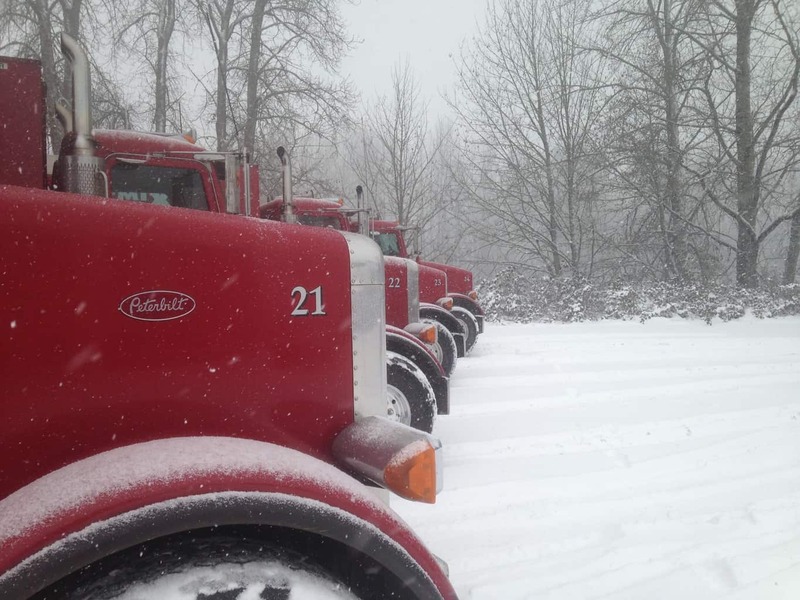 Today, we sell new and used Cemen Tech equipment in a seven-state area of the Pacific Northwest. What’s your approach to selling volumetric proportioning and Cemen Tech equipment? Pouring concrete is easy, but understanding the basics of concrete mixing is crucial, so we start the sales process by educating customers about the ingredients needed to make quality concrete. Then we’ll walk customers around a mixer to show them how those ingredients are mixed on site to exacting standards. Finally, we’ll take them out on a pour to show them how easy it is to operate the equipment. What does the future hold for your various businesses? We will continue to serve our contractor base by delivering high quality concrete when and where they need it. We anticipate our rapid setting concrete business will grow as Oregon and Washington approve specifications for this application and the use of volumetric proportioning in pouring the product. That increase should also spur our new and used equipment sales.Things will continue to grow for a business we began with little knowledge of concrete. We’ve come a long way in 23 years,and so have our customers. That’s what it’s all about! MARKET AREA: Nation’s Mini-Mix operates in a 25-mile region around its offices in Springfield, Oregon. Nation’s Equipment Sales is licensed to sell used and new equipment in Oregon, Washington, Idaho, Utah, Montana, Alaska and Hawaii.